So I had my truly first custom crown order 2 weekends ago at the craft fair at FUMC Pasadena. 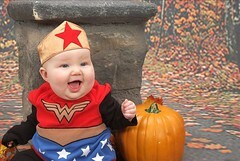 This mom needed a wonder woman crown to match her little girls halloween costume, and I couldn't wait to get home to make it. I even sold another to a lady up in NYC for her halloween party! She was kind enough to send me a picture of her beauty in it, and allowed me to post it. How cute is this little one?? I've also received quite a few custom orders for birthday crowns, now that I've ventured into the hand sewing of the felt. I think they're adorable. Can't wait to see posted pictures of the little ones in them! This is a blog to support my new venture, my etsy store! I enjoy sewing and making many different things, and thought I could help support my family in doing so. Please visit my etsy store at http://mistysblessings.etsy.com. So many new things!! And a discount! !